I’ve been dying my hair since I was a teenager, sporting every colour from black to bleach blonde in that time. But over the last few years I’ve pretty much stuck with the standard half head of highlights every time I go to the hairdresser. Then one Saturday in September I was in the gym exercising behind a woman with the most beautiful blue-green hair. I spent the whole of my BodyCombat class admiring her. As I left the gym I thought “Wow, she was pretty amazing and I am pretty boring.” On my way home I called into Superdrug at Brighton Station and picked up a tube of L’Oreal Paris Colorista in Dirty Pink. And that’s how my time as a pink lady began. Since then I’ve tried out lots of different pink hair dyes, some of them better than others. Here’s the pick of the bunch. The lighter your base colour, the brighter your hair will be. 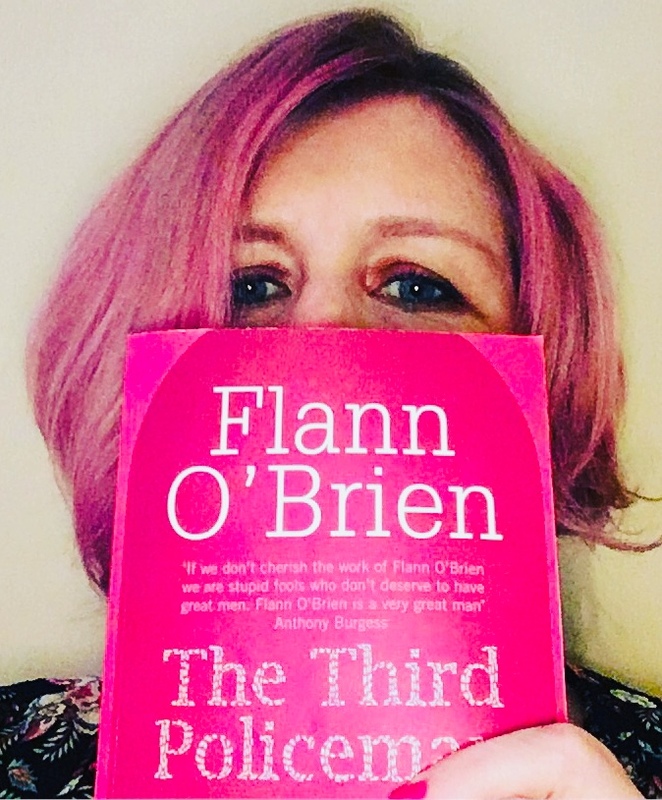 If you want a proper pink then you may need to pre-lighten your hair in some way. I’ve been putting these pink hair dyes on top of blonde highlights. It means that the roots blend in better and I don’t have to get my highlights redone so often. All pink hair dyes fade after a few weeks. Hair that’s been lightened is more porous, so it will absorb the pink dye strongly, but it will also let it go just as fast. 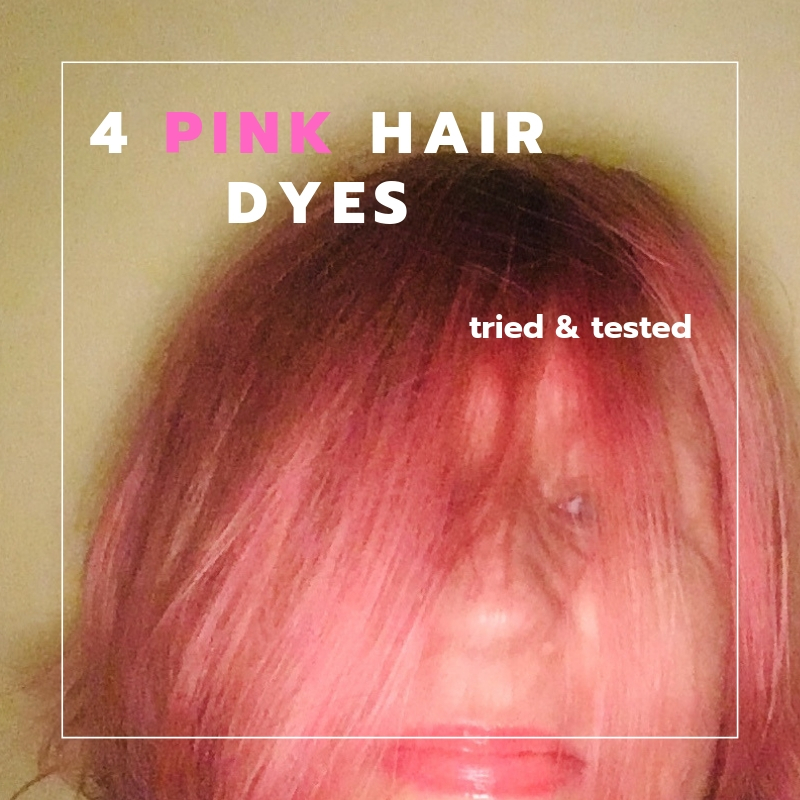 Personally I like how this hair colour changes every time you wash it, but if you want to keep your hair consistently pink then be prepared for plenty of upkeep. You’ll make friends! Pink hair really seems to make people want to chat about it. Lime Crime Unicorn Hair Neon Peach – More expensive than the others at £14.50, this was the best one. 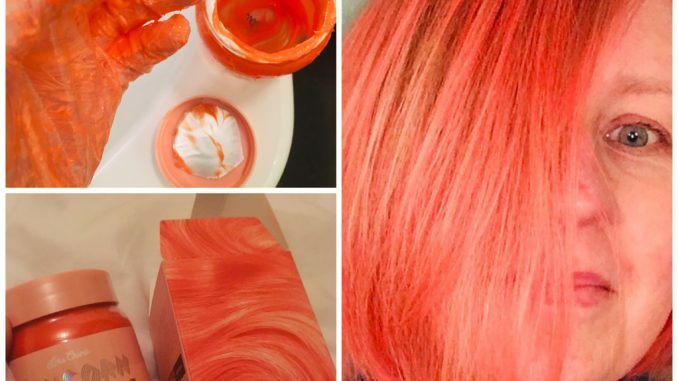 It’s a beautiful pinky orange that fades down to a pinky pastel ginger over time. I probably should mention that I left it on for nearly two hours, when I was watching a film (not at the cinema, you will be glad to note). 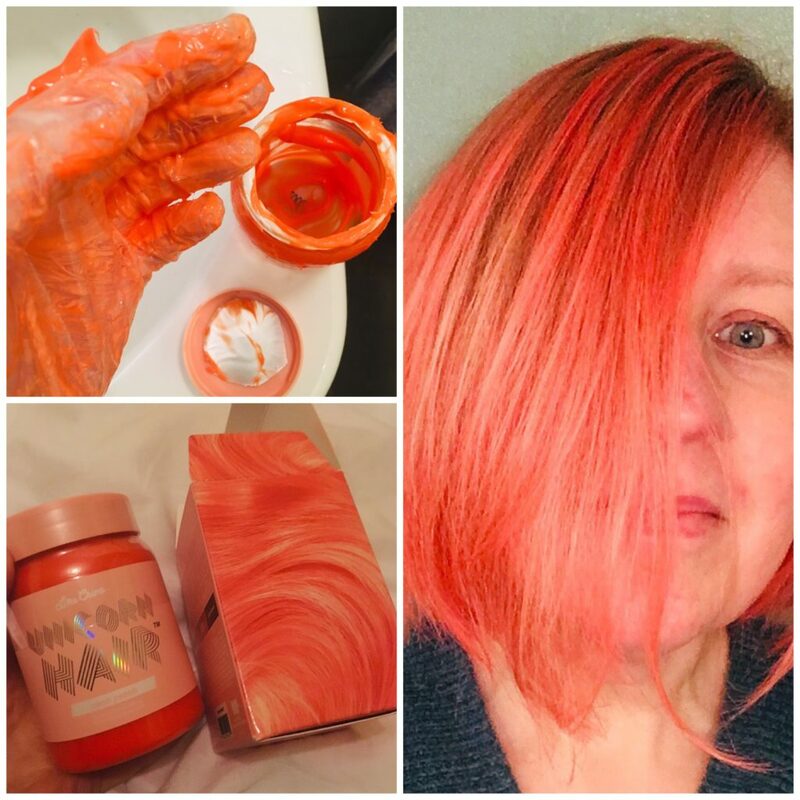 L’Oreal Paris Colorista in Dirty Pink – This was the first of the pink hair dyes I tried. Starts bright but fades in 3 to 5 washes. 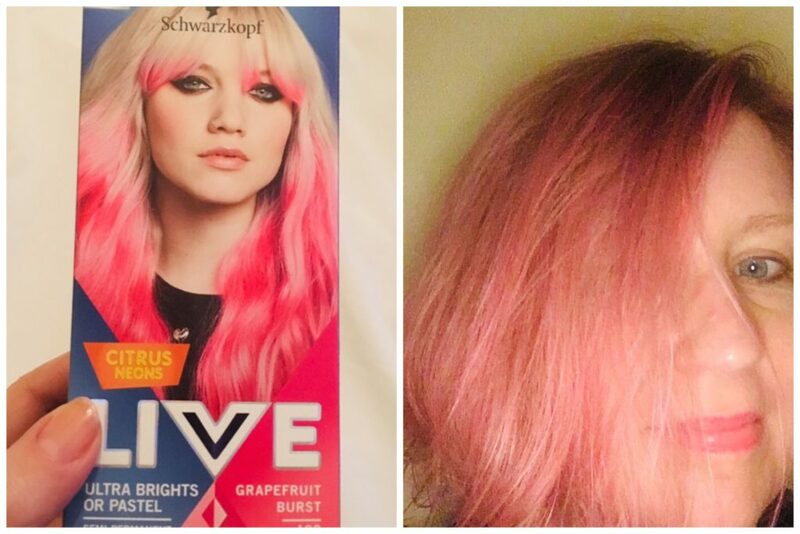 This is a good one to start with if you’re unsure about going pink. Bonus points for matching my book. Schwarzkopf LIVE Ultra Brights Grapefruit Burst – At this point I was ready to go for something a bit brighter, so I opted for this neon number. As you can see from the pic, it’s a nice shade but not as bright as the picture on the box promises. This one is great value, since for under a fiver you get the pink hair dye, two sachets of conditioner and a pair of gloves. Most of the pink hair dyes shown here don’t come with any of that stuff, so stock up on rubber gloves. I Heart Revolution Rainbow Tones Pink Cloud – Absolutely the worst. 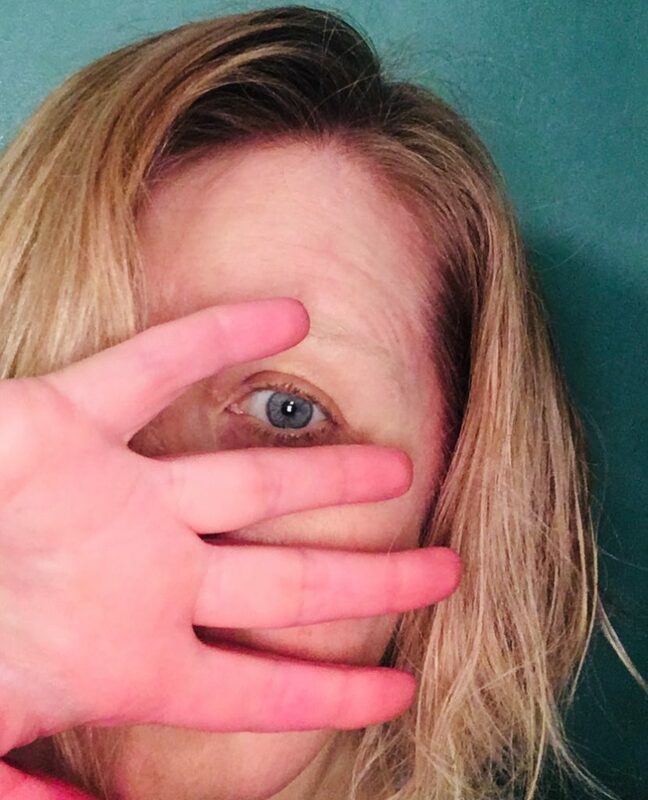 This dyed my hands, my face, my scalp pink – pretty much everything apart from my hair. Superdrug, you let me down! At least I only wasted £3.99. Suitable for vegans, so maybe buy it for a vegan if you want them to look like a ham for a laugh.